I had a bunch of pitas in my house after our party this weekend and I was trying to think of different ways to use them up. What is easier than making a breakfast pizza using a pita? 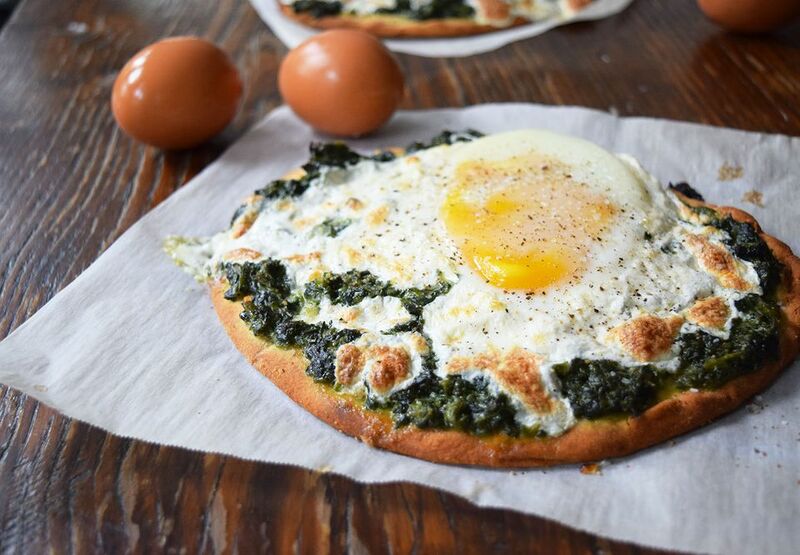 The pita makes a perfect crust and stands up really well to the cracked egg and creamy spinach. Whenever I make creamed spinach I always end up having some left over. I freeze it so I can use it for dips, pizzas, and other yummies. I use Emeril's basic creamed spinach recipe, with a few of my own tweaks. It's creamy, cheesy, and completely decadent. And it tastes amazing on top of a pita and topped with a freshly cracked egg. You could also top this with scrambled eggs after you are done baking! I love spinach for breakfast! It's delicious in a spinach feta breakfast wrap and it's amazing on this breakfast pita. There's nothing like getting those greens in your system first thing in the morning. Prepare the creamed spinach first. Boil a pot of salted water. Add the frozen spinach to the water and cook until completely thawed and cooked through. Drain and squeeze the spinach in a sieve to remove any excess water. Place the butter in a sauce pan. Heat until the butter is melted. Add the garlic and onion powder, and salt and pepper. Stir to combine and then add the the drained spinach. Add the heavy cream and stir to combine. Cook until the cream is reduced and slightly thickened. Add the parmesan cheese and stir to combine. Let the creamed spinach cool slightly and preheat the oven to 450 F.
Spread an even amount of the creamed spinach mixture on top of each pita. Top each pita with the grated mozzarella cheese. Gently crack an egg on top of each pizza. Be careful not to break the yolk. Place in the oven and cook for about 15 minutes, or until the egg white is cooked and set, but the yolk is still runny! Remove from the oven and sprinkle with salt and pepper and grated parmesan cheese. Cut into triangles and serve immediately!